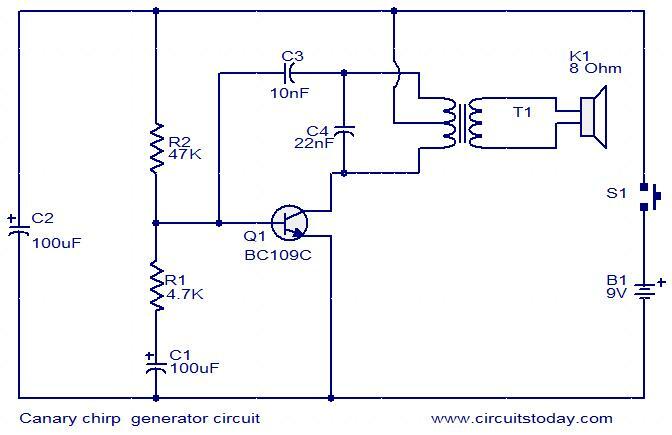 This is a simple electronic alarm circuit that imitates the chirping of a canary. The circuit is nothing but a Hartley oscillator with few more passive components added. As the capacitor C1 charges through the resistor R1 and the transistor Q1 is driven to cut off. This makes the oscillations to stop. As the capacitor discharges through the Resistor R1 and base emitter junction of the transistor the oscillation start again. Actually the R1 and C1 are the components that make the characteristic chirping sound. The circuit can be powered from a 9V PP3 battery. The transformer T1 can be a audio output transformer like LT700. If LT700 is not available, try the audio output transformer used on you old transistor radio board. The speaker can be an 8 ohm tweeter. Switch S1 can be a push button switch. The chirping sound can be altered by changing the value of R1 and C1. Not only did you steal the circuit from a unniversity student BUT you also removed his COPYRIGHT. Then to increase the crime you then stick you name on it. Says a lot about your web site. I will file complaints with sarch engines and your host server owner.